RPU has partnered with The Arbor Day Foundation’s Tree Line USA® program, which recognizes public and private utilities that demonstrate practices that protect and enhance America's urban forests. This program promotes the dual goals of safe, reliable electric service and abundant, healthy trees across utility service areas. 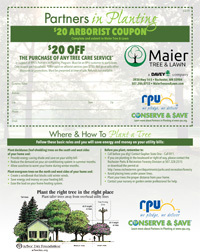 RPU has also partnered with local nurseries, Jim Whiting Nursery & Garden Center and Sargent’s Gardens to give you a $10 discount on the purchase of qualifying deciduous shade trees and with local arborist, Maier Tree & Lawn, for $20 off a tree service. Click here to download our Partners in Planting brochure. Now we want to partner with YOU to plant trees all over Rochester! Why is RPU forming so many partnerships to “green-up” Rochester? Because planting trees makes sense for your pocketbook, your family’s health, and the future of the environment. According to the U.S. Department of Energy, carefully positioned trees can save up to 25% of a household’s energy consumption for heating and cooling. Not only that, trees clean the environment. One acre of trees provides enough oxygen for 18 people for one year and absorbs as much CO2 as a car produces by driving 26,000 miles. 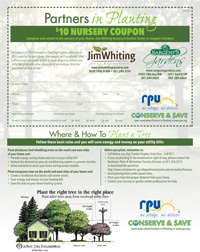 Follow these basic tree-planting rules and you will save energy and money on your utility bills. Provide energy saving shade and save on your utility bill. Reduce the demand on your air-conditioning system in summer months. Allow sunshine to warm your home during winter months. Create a windbreak that blocks cold winter winds. Save energy and money on your heating bill. Ease the load on your home heating system. Call before you dig! Contact Gopher State One-Call - Call 811. If you are planting in the boulevard or right of way, please contact the Rochester Parks & Recreation Forestry Division at 507.328.2515 or download the permit at http://www.rochestermn.gov/departments/parks-and-recreation/forestry. Avoid placing trees under power lines. Plant your trees the proper distance from your home. Contact your nursery or garden center professional for help. Arbor Day was founded by J. Sterling Morton, an early pioneer to Nebraska who loved nature and saw the need for planting trees in the vast prairies of the state. Arbor Day was first observed in 1872, when more than one million trees were planted in Nebraska. Arbor Day is now observed throughout the nation and the world. For more information about Arbor Day, visit the National Arbor Day Foundation website at www.arborday.org. Each year, beginning on the last Friday in April, RPU encourages the Rochester community to plant trees in celebration of Arbor Day. Click here for details on our Arbor Day events and plan to have your family attend!